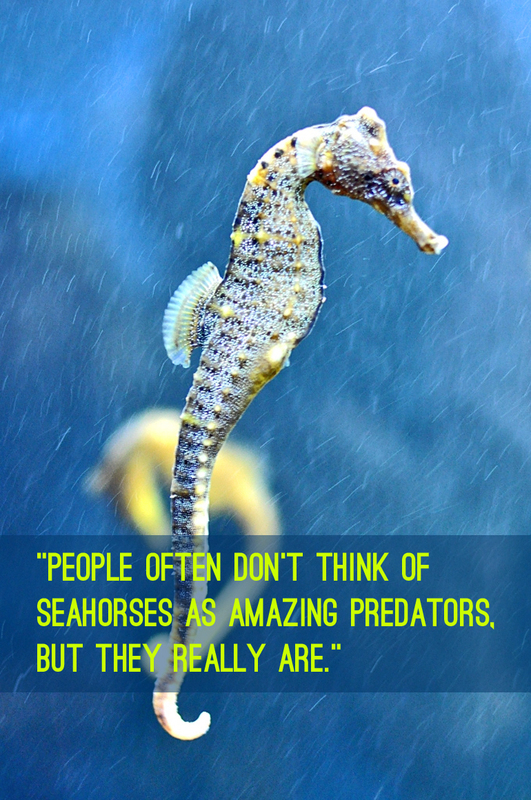 They may be slow swimmers, but seahorses are amazingly fast when it comes to snatching prey. “A seahorse is one the slowest swimming fish that we know of, but it’s able to capture prey that swim at incredible speeds for their size,” says Brad Gemmell, research associate at the University of Texas Marine Science Institute. For their study, Gemmell and his colleague Ed Buskey, professor of marine science, turned to the dwarf seahorse, Hippocampus zosterae, which is native to the Bahamas and the United States. To observe the seahorses and the copepods in action, they used high-speed digital 3D holography techniques developed by mechanical engineer Jian Sheng at Texas Tech University. The technique uses a microscope outfitted with a laser and a high-speed digital camera to catch the rapid movements of microscopic animals moving in and out of focus in a 3D volume of liquid. The holography technique revealed that the seahorse’s head is shaped to minimize the disturbance of water in front of its mouth before it strikes. Just above and in front of the seahorse’s nostrils is a kind of “no wake zone,” and the seahorse angles its head precisely in relation to its prey so that no fluid disturbance reaches it. Other small fish with blunter heads, such as the three-spined stickleback, have no such advantage. Gemmell says that the unique head shape of seahorses and their kin likely evolved partly in response to pressures to catch their prey. Individuals that could get very close to prey without generating an escape response would be more successful in the long term. “It’s like an arms race between predator and prey, and the seahorse has developed a good method for getting close enough so that their striking distance is very short,” he explains. Seahorses feed by a method known as pivot feeding. They rapidly rotate their heads upward and draw the prey in with suction. The suction only works at short distances; the effective strike range for seahorses is about 1 millimeter. And a strike happens in less than 1 millisecond. Copepods can respond to predator movements in 2 to 3 milliseconds—faster than almost anything known, but not fast enough to escape the strike of the seahorse. Gemmell says that being able to unravel these interactions between small fish and tiny copepods is important because of the role that copepods play in larger ecosystem food webs. They are a major source of energy and anchor of the marine food web, and what affects copepods eventually affects humans, which are sitting near the top of the web, eating the larger fish that also depend on copepods. The team published their research in Nature Communications.